How Does a Zamboni Work? 1 How does a Zamboni work? That is exactly what Frank J. Zamboni had to figure out in the early 1940s when he began experimenting with his idea of creating an automatic ice resurfacing machine. 2 Before the invention of Zambonis, ice rinks were resurfaced by a machine pulled behind a tractor. These ice resurfacers shaved off the rough surface of the ice, but that is all they did. They did not collect the ice shavings, clean the ice, or put down a new surface. 3 Using one of these machines, it could take an hour or more just to make the ice smooth enough to skate on. Several workers had to follow the machine around the rink to sweep up the ice shavings. Then water had to be sprayed on the entire surface with hoses. Finally, the ice had to be squeegeed to spread the water thin and allow it to refreeze. 4 One by one, Mr. Zamboni found solutions to each of the problems posed by the old ice resurfacing machines. He built and experimented with many models. He used all kinds of materials including army surplus parts to build his machines. Finally, he created one that worked the way he wanted it to. 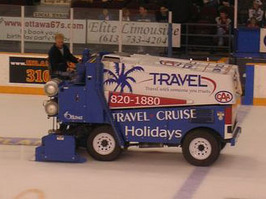 5 The first real Zamboni, the Model A, was produced in 1949. It was a hit, and the popularity of Zambonis spread. In 1960, the Zamboni made its debut in the Winter Olympics. Feedback on How Does a Zamboni Work?